Prepare your body to be strong enough to carry out the increased number of tasks and responsibilities which will be placed upon you. Eat healthy. Try to exercise regularly. Quit smoking if you are a smoker. Preparing yourself mentally for becoming a father means, growing up, maturing as a human being. Accepting the responsibilities and carrying them out in a very dedicated way. 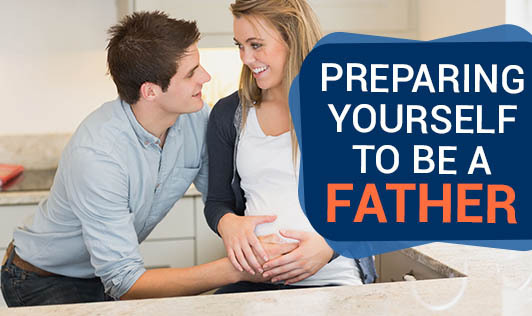 These are the changes you will notice once you are ready to be a father. Remember, your child will look up to you and behave in the same way as you do! When you plan to start a family, one of the most important things you think about is whether you can afford it financially. It is very important to be financially sound when you are expecting a baby. You have to secure the baby's future and make sure that your child lives comfortably and worry free. All these things...the planning, the preparations, the efforts, the changes, are not only for you as a person, but for your own baby, who is on her/his way!